For potential customer we have developed an entirely new concept of mobile crane. It will eventually replace currently working devices. The crane will be characterized by simple construction, high reliability in difficult weather conditions and low cost. Practically all of its movements will use electric drive (with the exception of push-out crane support, which will will require a hydraulic drive). The use of an electric drive (diesel engine or power supply) allows continuous operation without a fear of breakage due to damage of combustion engine. 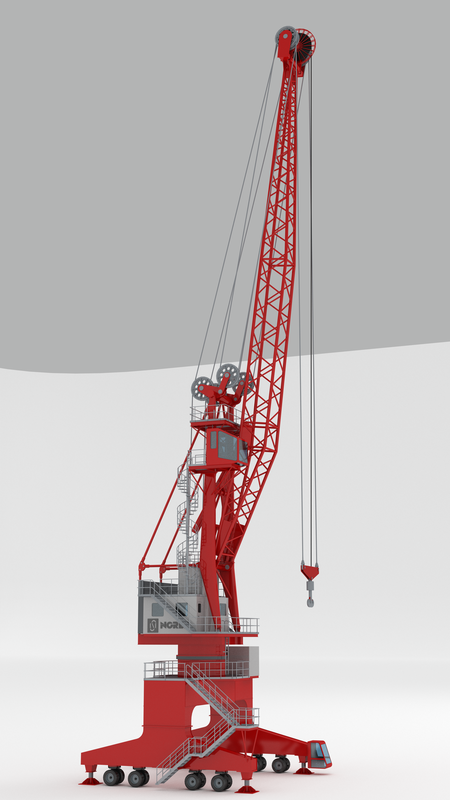 The mobile harbour crane concept was developed jointly with Nores. We took into consideration not only the customer's needs, but also his previous experience in the usage of mobile cranes. Also we will highly recommend this solution to other customers who are suffering from similar problems with mobile cranes.